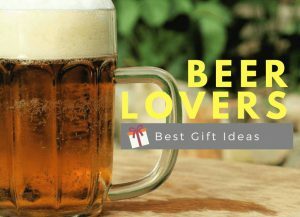 If you have been looking for Unique Wedding Gifts for Couples, look no further. 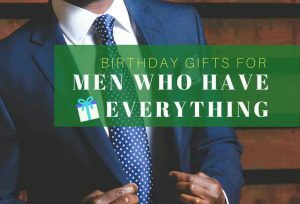 We understand that choosing gifts for the new Mr. and Mrs. can sometimes be quite tough because it’s difficult to find a gift that is both meaningful and unique. 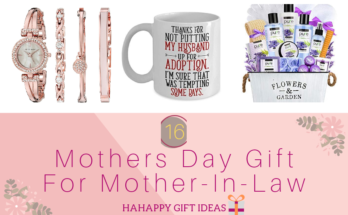 So allow us to lend a helping hand for you to find the perfect wedding gift that newlywed couples will love – from personalized key holder to gorgeous Copper Mugs Set, His and Hers bathrobes, Fashionable Passport Holder, Wedding Champagne Glasses Set, and some much more sweet wedding gift ideas. 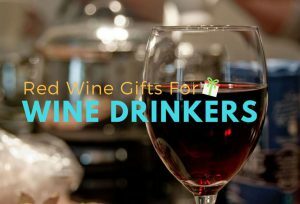 Looking for unique wedding gifts for couples who have everything? Then this Mud Pie Wedding Champagne Glasses Set is exactly what you need to get them. 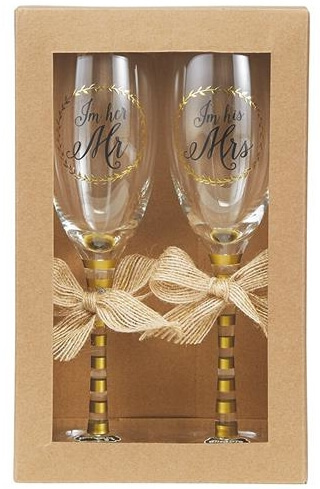 These novelty champagne glasses feature “I’m her Mr.” and “I’m his Mrs.” sentiments, and lovingly packed in a Kraft paper gift box. 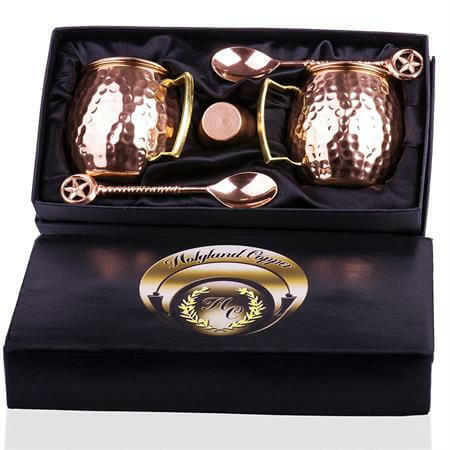 This Gorgeous Moscow Mule Copper Mugs set is perfect for the classic loving wedding couples on your gift list. They are such beautiful new-age glasswares that help drinks stay cold for longer. Stunning and yet functional! 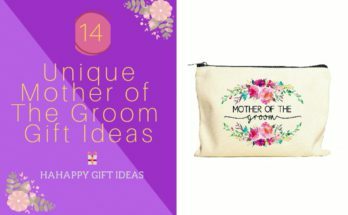 Looking for creative wedding gift ideas? 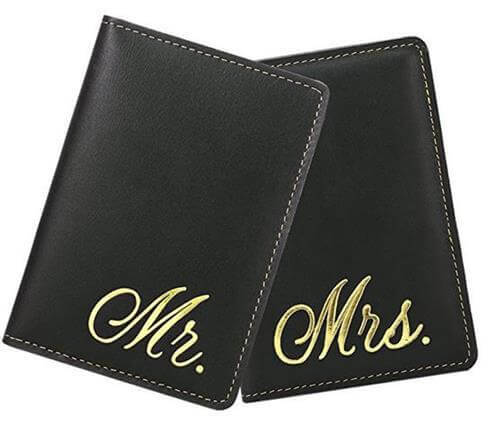 These pair of matching passport holders are super cool for the jet-setting couple because they’re designed with fashionable gold Couple’s printing. This RFID blocking holders are made of 100% high-quality full grain leather. After the wedding ceremony, there is no better place to relax than the outdoors. 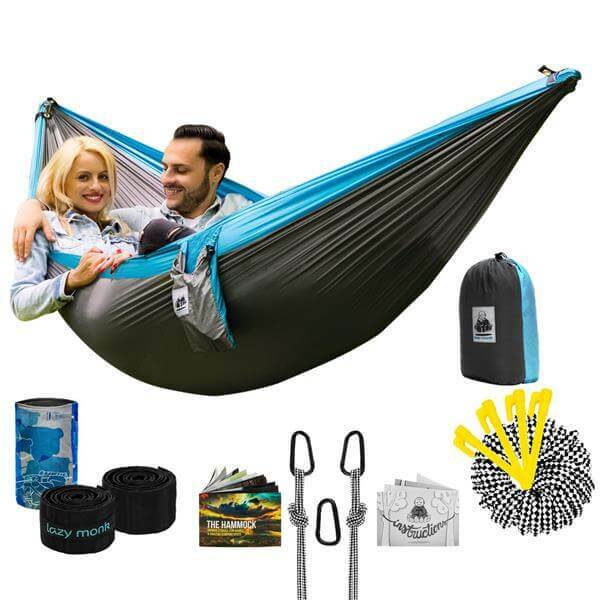 Wedding couples will love this Double Camping Hammock that lets them savor peace and quiet! It is not only safe but it also waterproof, lightweight and versatile. 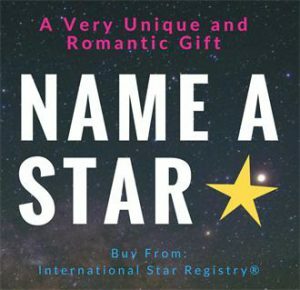 If you are looking for unique personalized wedding gifts, search no more. 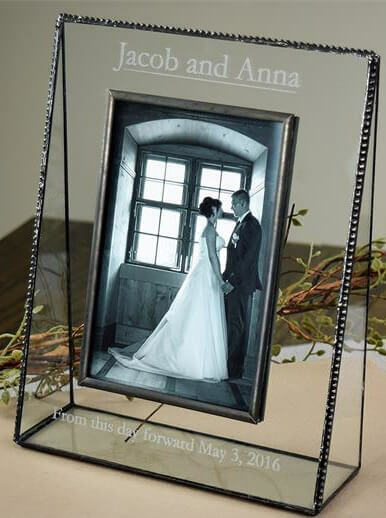 Wedding Day is full of memories and love, with this beautiful Personalized Wedding Engagement Photo Frame, they can display their big day and share it with everyone. 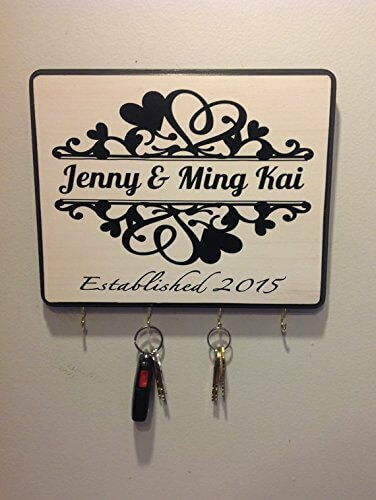 If you’re looking for a personalized wedding gift ideas for a couple already living together, this Monogram Key Holder — with a black and white paint that comes with beautiful personalized monogram, couple’s name and established year — will instantly make a great, lovely addition to their new home. 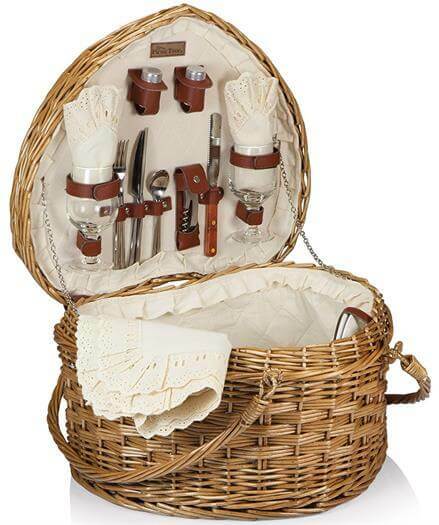 The Picnic Time Heart picnic basket is perfect for those couples who love camping and picnic. This heart-shaped basket includes all the amenities needed for a romantic picnic for two. 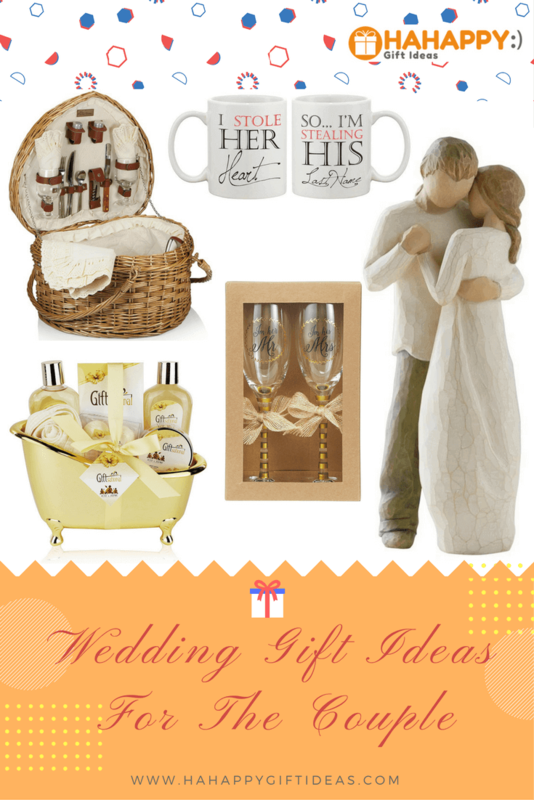 The wedding couple will love you for it! 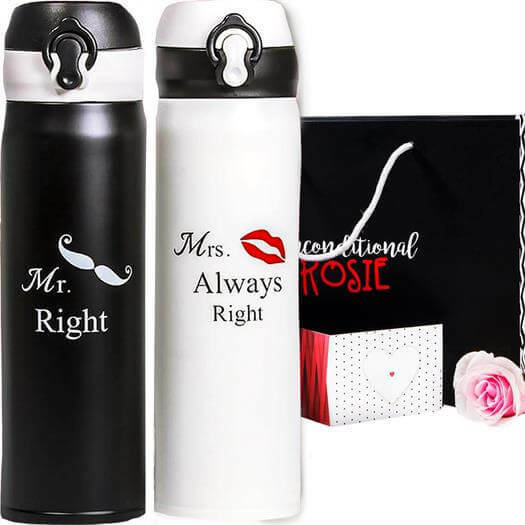 These beautiful thermos set make a useful and adorable gift for the wedding couple! 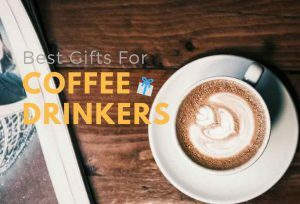 These flasks keep drinks such as tea or coffee hot for up to 12 hours. It’s not just cute and sweet, but it also high in quality – double walled, leak-proof, insulated thermos, and BPA-free. If you’re looking special wedding gifts for couples who have everything, give them this beautiful Willow Tree Promise Figurative Sculpture and you can’t go wrong. This art forms beautifully express promise, love, and closeness. It’s perfect for the sentimental couple. 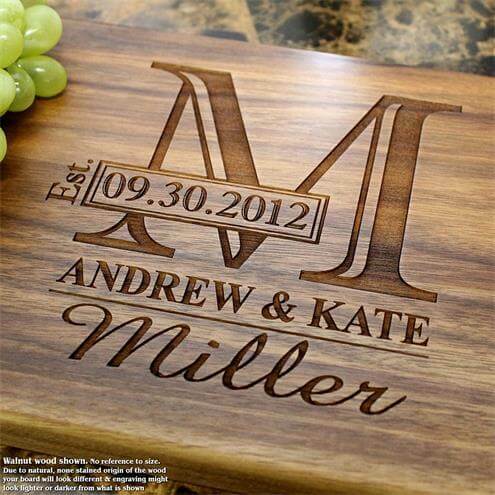 This Monogram Personalized Engraved Cutting Board makes a perfect gift for the wedding couple that cooks. You can engrave a beautiful design of your choice on this unique cutting board. It is sure to be a cherished keepsake for years to come! 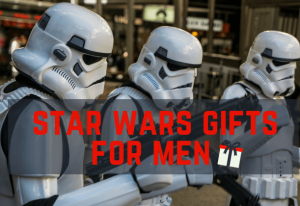 Choosing gifts for a newly married couple? This “I Stole Her Heart, So I’m Stealing His Last Name” Couple Mugs will be a perfect choice. This sweet, yet elegant set will add a touch of romance to their new home. It’s made from the USA and microwave/dishwasher safe. 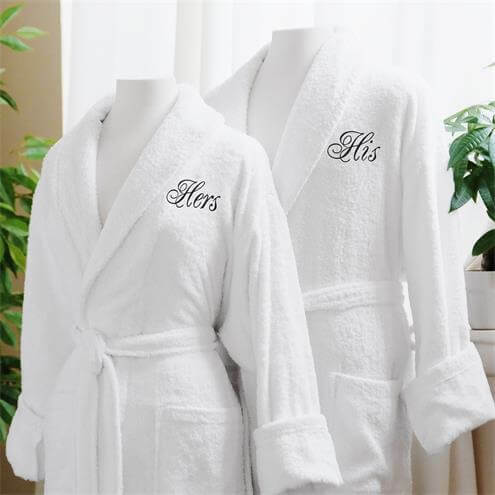 Great marriage gifts for friend. If you’re looking to scoop a scent set for a couple that loves the spa, search no more. This beautiful rose and jasmine spa gift set is designed for the sensual of spirit and romantic at heart. What better than bathing in this heavenly floral mix after the wedding, it will melt away all their stress and worries. 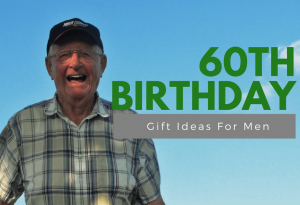 Many thanks for posting a great selection of gifts for these special occasions. There is a great selection to choose from and i especially like the his and her’s leather card holders. Not only are they attractive and very usable, but they offer a certain level of security, when we are travelling abroad. I especially love the double hammock idea and the cutting board! We actually received a personalized cutting board for our wedding and it is one of my favorite items! I also like to give couples massages or something they can use in their first year to “date” as dating in marriage is so important! Thank you for the comment and feedback. 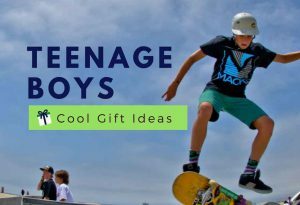 Wow, great gift ideas! I recently attended a wedding and ended up getting something very generic. 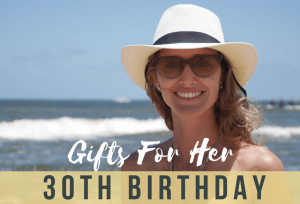 Personalizing gifts takes effort and planning. I want to be that type of gift giver one day. 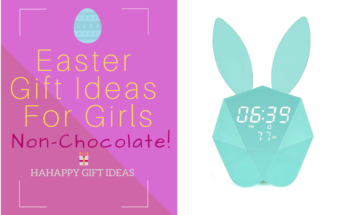 I bookmarked your site to visit occasionally for ideas! My favorite gift idea was the hammock. Thanks again! 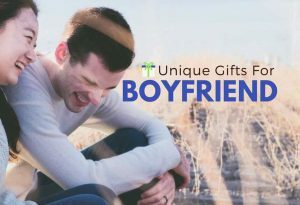 We’re happy that you like our list of Unique Wedding Gifts for Couples. 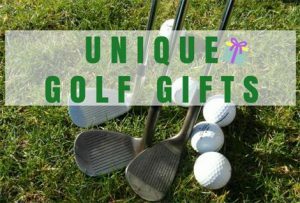 Welcome to visit us again when you need a gift idea, thank you.